I went to the printer last night to pick up the posters. They were printed on the wrong printer stock. We wanted the posters printed on cardstock. It was printed on 80lb paper instead. So the entire run has to be printed again. Our motto is Premium or go home. The print quality was amazing! ReBoot fans will LOVE this product! The metallic ReBoot logo is beautifull. Gigabyte looks really imposing at this blown up scale. Those who have ordered will have to wait a week longer to get their posters but trust me, the wait is well worth it. Gigabyte Poster now on SALE! 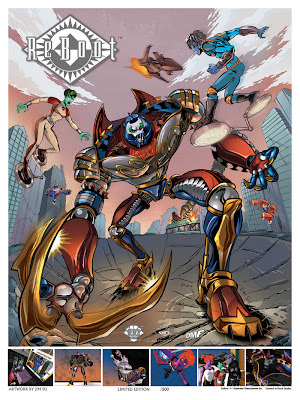 The Gigabyte Poster is now on sale at DMF Comics. Get it before christmas if you order NOW. It is limited to 500 and only $15. Bundle and save if you order both posters that I drew. For only $25 get both the original ReBoot Poster and the New Gigabyte Poster! You also pay only one fee in shipping. Here is what the poster will look like.It features Rainmaker Entertainment's logo for the first time. The logos are printed in silver metallic ink! New ReBoot Poster coming soon! Just got a new license for a new poster. Still in the designing process so I will post a preview as soon as possible! And since it's already November, we will take pre-orders soon to try to get these posters to the fans before Christmas. Crozonia now on sale at DMF comics! It's always good to have multiple points of sales for an indy comic book, so I'm pleased to announce that you can now buy the first three issues of Crozonia at DMFcomics.com! Please support this unique online store - all the products carried are produced by DMF and Beach Studios. So order a copy of Silent Leaves or Demented while you order my books!